Well, I have come to the end of my trial of Girl Scout Cookies. As you read from my previous 2 posts, I have really not been impressed. After sampling the Tagalongs last night, I can say that in all 3 of my Girl Scout Cookie Tastes, I have been fully unimpressed. Long gone are the years when I would wait and crave the limited time availability of Girl Scout Cookies. Those days are long gone. They have been replaced with the feeling of No More Tagging Along. 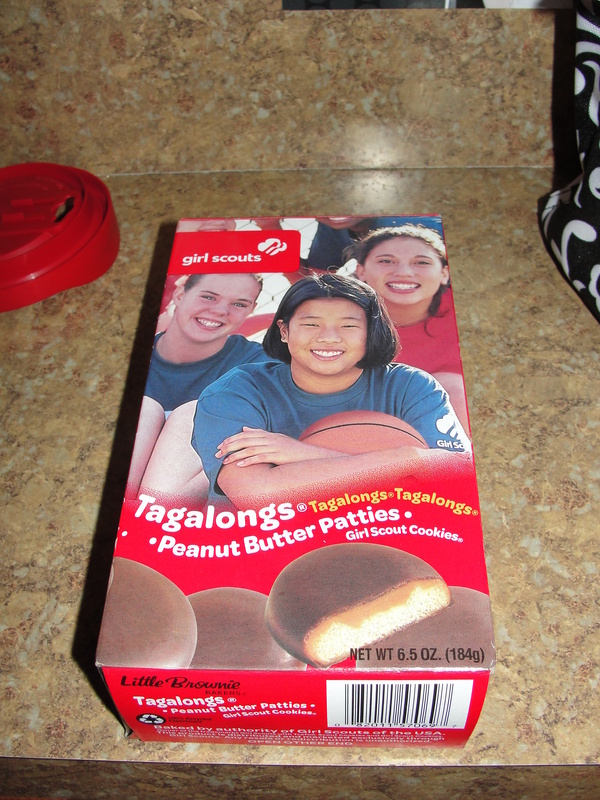 Tagalongs used to be my absolute favorite Girl Scout Cookies. I used to eat them in such a strange way. I would nibble around the entire diameter of the cookie and then eat the core in a bite or two. So weird for sure. 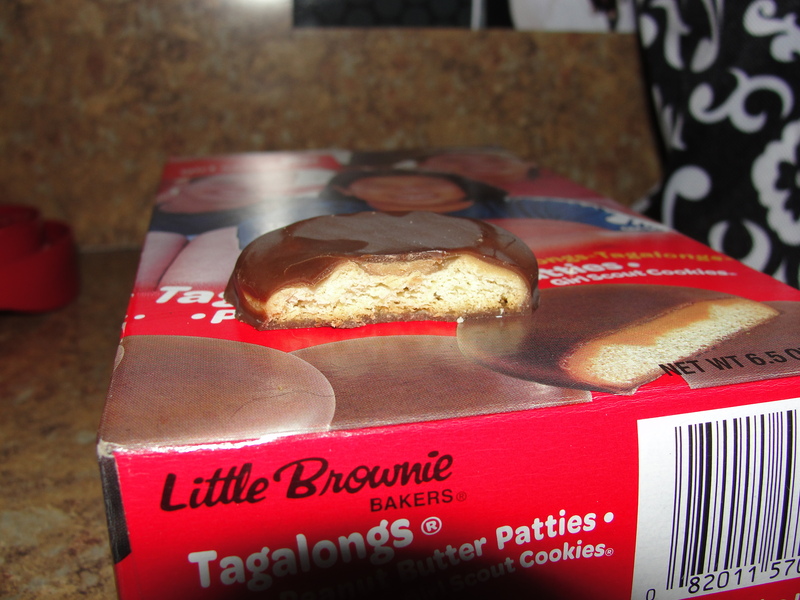 The Tagalongs are described as, “Crispy vanilla cookies layered with peanut butter and covered with a chocolate coating.” By description alone, these sound great. And they certainly used to be. But, they are no longer. 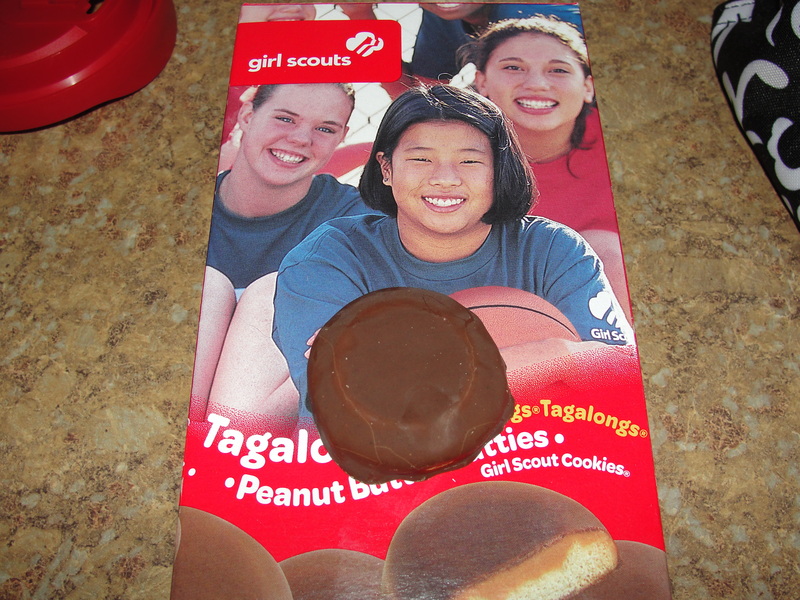 I took the box of Tagalongs out of the refrigerator and opted for only one cookie. I realize this may not provide the best overall sample but I just didn’t want two cookies – which is the normal serving size. This is another box where the amount of cookies you receive has continued to go down. The size of the cookie looked about the same as what I recall and I was pretty excited to have one again. The excitement was gone with the first bite. Wow, was this cookie bad. I did not do my old school version of nibbling & two bites but rather just bit right into the cookie. After biting in, I looked at the cookie to be sure they remembered to add the peanut butter. From taste alone, I could not taste the peanut butter in the least. The amount of peanut butter in this cookie was so minimal it was crazy. I recall the cookies including a good deal of nice, gooey peanut butter but, the Tagalongs no longer have this. Sadly, the poor taste of this cookie did not end with the lacking peanut butter. Ohh no if only it did. The vanilla cookie was nothing of the such. The cookie itself had a funky taste and the consistency was on the verge of being stale. There is no reason why this should be stale. These cookies were received the first day Girl Scout Cookies were released to the public and placed in the refrigerator right away. Did I perhaps receive a leftover box from last year? The chocolate that was covering the lacking peanut butter & stale vanilla cookies was pretty bad as well. The chocolate did not taste like chocolate in the least. It was kinda sweet and maybe on the verge of being a really bad chocolate but, I can’t say that I would have known it was chocolate if I was blindfolded. It was in no way creamy or good as chocolate should be. And, of course, there was barely any of it. On top of the fact that all of the elements of this cookie were lacking and not good, the after taste this cookie left in my mouth was so gross. It was a mixture of stale-fake chocolate-faux peanut butter taste that was just not good. Even after having some milk after the cookie, the taste was still there. I ended up going and brushing my teeth just to remove the taste that this cookie left. I am so glad that I only took one cookie out of the box. Girl Scout Cookies are really on my no need to eat list. This is really such a bummer since I used to enjoy them so much. I would say that perhaps my pallet is just expanding and I am learning to enjoy better things but, I don’t know if this is so. I really think the quality of the cookies has just gone down and the Girl Scouts making them just don’t care. I will most certainly not be handing out a badge for these cookies. The Tagalongs had poor ingredients and overall poor taste. I can surely say that there will be No More Tagging Along for Me. I am bummed to hear that the quality of the cookies have declined so. I use to be a girl scout about 15 years ago and I loved their cookies!